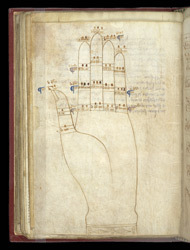 Drawing Of A 'Guidonian Hand', In A Collection Of Tracts On Shorthand, Music, Etc. bl.uk > Online Gallery Home	> Online exhibitions	> Illuminated manuscripts	> Drawing Of A 'Guidonian Hand', In A Collection Of Tracts On Shorthand, Music, Etc. In the Middle Ages the cost of binding books was a considerable part of the overall expense of creating a manuscript, so, rather than bind short works individually, several different works--having more or less in common with one another--would often be bound together. This volume, of only 80 leaves, contains a dozen texts, originally written as several different sections. A late medieval list of contents and press-mark on a flyleaf shows that it used to contain even more texts, and belonged to the library at the abbey of Bury St. Edmunds. In the 11th century Guido of Arezzo developed a method of learning music, which involved giving each note a name: ut, re, mi, fa, sol, and la. Also commonly attributed to him is a system of assigning notes to parts of the hand, so that a music teacher could point with one hand to parts of his other hand, and therefore indicate to a whole group of singers which note to sing.